Today I'm starting a series of articles about the LEGO Pick-A-Brick cups that are sold at official LEGO Brand Retail stores. These plastic containers can be packed to the max and is one of the best ways to boost your parts collection. More often than not you need many of the same kinds of pieces to create a pattern, a special detail, a roof, a wall, a floor, or even supports to make your creations. 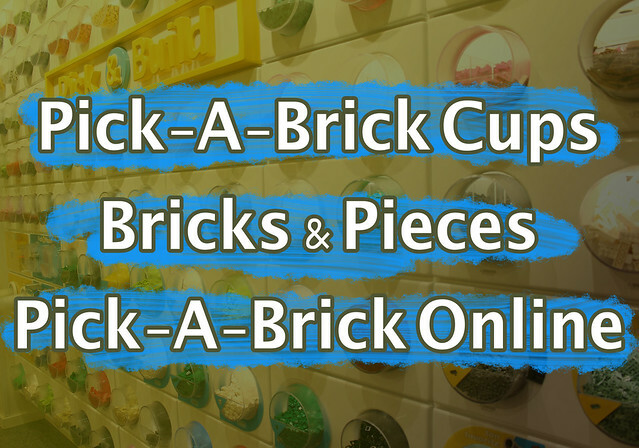 Before we get started with the Pick-A-Brick (PAB) cups series, we will start with a brief overview of PAB cups and also two other ways of purchasing individual LEGO pieces from the LEGO Group. The other two forms are being covered in this introductory article since they may be used as comparison points during the main Pick-A-Brick cups series. Plus, they are good resources to know about for just about any LEGO fan. In case you don't already know about Pick-A-Brick (PAB) cups, they come in two sizes. You pack pieces into these cups, bring them to the counter and then purchase with the pieces inside them. The price is not by weight, so if you have the time, definitely try to do at least a little bit of packing before buying. This series of articles will mostly be focused on individual pieces and different ways to pack them based on the amount of time you have available to spend, even factoring in how far it takes to drive to a store and comparing prices to other means of buying individual pieces in larger quantities. Any of the articles that involve a good bit of math will be part of the PAB Math sub-section. The rest of the articles will deal with more general topics and price comparisons. 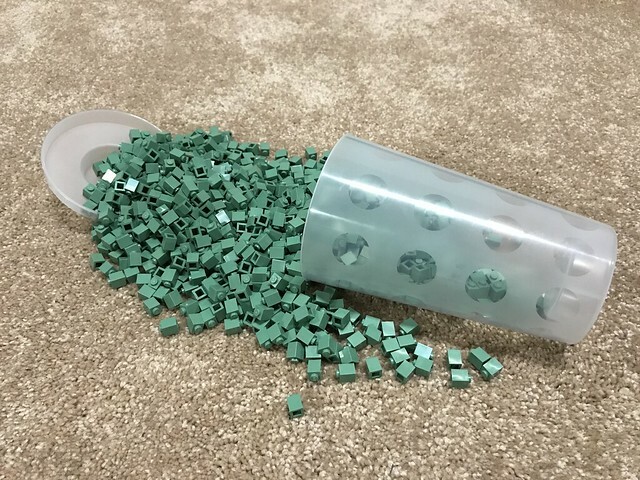 PAB Cups are found in the Pick and Build section of official LBR (LEGO Brand Retail) stores, and is also commonly referred to as the Pick-A-Brick Wall. There was a brand shift from Pick-A-Brick to Pick-and-Build when the buildable sets from pieces on the wall was launched. If you search for Pick A Brick on Google, you will likely see a link for the LEGO Online Pick A Brick area. It's not widely known that you can buy individual parts directly from the LEGO Group. Perhaps it is more well known amongst active builders and people involved in a more organized (and perhaps recognized) LEGO Users Group. Nonetheless, it is more accessible now more than ever because it's instantly accessible from the Bricks tab on the LEGO Shop website. From here you can search through all kinds of filters - color, elementID, brick type, etc. and unless you know what you're looking for, you could spend a good deal of time searching and adding bricks to your virtual cart. The selection here isn't endless, however, as you can see from the screenshot. I searched for the exact color Olive Green from the list of colors and only a 1x2 plate and a cheese slope came back. Nevertheless, the selection is vast compared to the 40-80 unique pieces available on a given Pick-A-Brick wall. 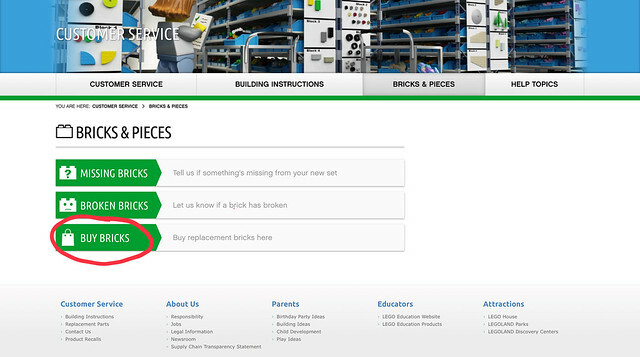 If you choose Replacement Parts from the Bricks tab instead of Pick A Brick, you will find that you are now on the Customer Service Page. From here you you can take several actions that are self-explanatory. The entire section is referred to as Bricks & Pieces, but to us the action we are looking for is the Buy Bricks link. You will be asked to confirm your age, so please don't lie. If you are under 18 and you want to see what's available if you are over 18, ask your parent to look at this with you and have your parent fill out the form and browse through the options together. Now on the main Bricks & Pieces page (18+), you can search for sets and individual pieces. I prefer the set option because I usually know what piece I want because of a set that it's found in - and it saves the trip of looking up the element since finding a set number is much easier to find in my opinion. When the search form is filled out, the pieces that match your query will appear and you have an even larger selection of pieces to buy, though the pieces are a bit more expensive than the same piece if bought from the Pick A Brick online section. 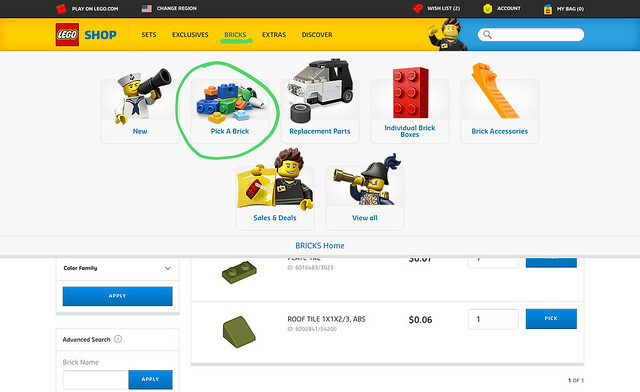 Sometimes, pieces available through the Pick A Brick online section are sold out on the Bricks & Pieces section. This is an excellent way to get some new parts in a larger quantity than would be available in a set. It's also a good way to compare prices on other third-party sites that sell individual pieces. The best price per piece is going to be Pick-A-Brick cups more than 90% of the time. However, it is the most time consuming to reap the benefits given the time it actually takes to drive to a store and then do some (if any) packing of the cups. PAB cups also have the disadvantage of little variety and a rather slow rotation of parts. Still, if a piece you want ends up on the PAB wall, go ahead and grab one (or more) cups of them. Pick A Brick online and Bricks & Pieces are good alternatives due to their vast selection, and together comprise the go-to source for the maximum you should be willing to pay for a given piece (unless shipping is a concern). Don't let online sites and stores on eBay and BrickLink charge more for their inventory. That's all for now, I hope you will enjoy this ongoing series where we look at how to get the best brick for your buck. If this has been interesting so far, you're in the right place. The first brick I'll be covering will be, of course, the iconic 2x4 brick.